Jonathan Philip Chadwick Sumption, Lord Sumption, OBE, PC, FSA, FRHistS (born 9 December 1948), is a British judge, author and medieval historian. He was sworn in as a Justice of the Supreme Court on 11 January 2012, succeeding The Lord Collins of Mapesbury. Exceptionally, he was raised to the Supreme Court bench directly from the practising bar, rather than from prior service as a full-time judge. He retired from the Supreme Court on 9 December 2018 upon reaching the mandatory retirement age of 70. He is well known for his role as a barrister in many legal cases. They include appearances in the Hutton Inquiry on the UK Government's behalf, in the Three Rivers case, his representation of former Cabinet Minister Stephen Byers and the UK Department for Transport in the Railtrack private shareholders' action against the British Government in 2005, for defending the Government in an Appeal hearing brought by Binyam Mohamed, and for successfully defending Russian billionaire Roman Abramovich in a private lawsuit brought by Russian oligarch Boris Berezovsky. A former academic, Sumption was appointed an Officer of the Most Excellent Order of the British Empire (OBE) in 1998 and is also known for writing a substantial narrative history of the Hundred Years' War, so far in four volumes. Lord Sumption has been elected a Fellow of the Royal Historical Society (FRHistS) and a Fellow of the Society of Antiquaries of London (FSA). Sumption was the son of Anthony Sumption, a decorated naval officer and barrister, and Hilda Hedigan; their marriage was dissolved in 1979. He was educated at Eton College and Magdalen College, Oxford, graduating in 1970 with a first in History. He was elected a fellow of Magdalen College teaching and writing books on medieval history, before leaving to pursue a career in law. He was called to the bar at Inner Temple in 1975 and subsequently pursued a successful legal practice in commercial law. In the 1970s, Sumption served as an advisor to the Conservative MP and cabinet minister Keith Joseph, He wrote parts of Joseph's controversial 1974 Edgbaston speech, which was generally thought to have doomed Joseph's chances of becoming leader of the Conservative Party. Sumption and Joseph also co-wrote a 1979 book, Equality, in which they argued that no convincing arguments for an equal society have ever been advanced and that no such society has ever been successfully created. In the late 1970s Sumption was a regular contributor to The Sunday Telegraph. Sumption was appointed Queen's Counsel (QC) in 1986 at the relatively young age of 38, and elected a Bencher of the Inner Temple in 1991. He has served as a deputy High Court judge in the Chancery Division, and a judge of the Court of Appeal of Jersey and the Guernsey Court of Appeal. He has been a member of the Judicial Appointments Commission as well as a Governor of the Royal Academy of Music. Until his appointment to the Supreme Court, he was joint head of Brick Court Chambers. On 30 November 2007, when a practising barrister, Sumption successfully represented himself before Lord Justice Collins in a judicial review application in the Administrative Court concerning development near his home at Greenwich. The Guardian once described him as being a member of the "million-a-year club", the elite group of barristers earning over a million pounds a year. In a letter to The Guardian in 2001, he compared his "puny £1.6 million a year" to the vastly larger amounts that comparable individuals in business, sports and entertainment are paid. For a four-week trial (and all the preparatory work) in the UK in 2005 he charged £800,000 to represent HM Government in the largest class action in the UK, brought by 49,500 private shareholders of the collapsed national railway infrastructure company Railtrack. The Government had money and reputation at stake. The case examined some of the actions of the government, especially of former Transport Secretary Stephen Byers. Byers became the only former Cabinet Minister to be cross-examined in the High Court in relation to his actions in modern times. The UK Government won the case. On 4 May 2011 it was announced that Sumption would take a seat on the Supreme Court at a later date. 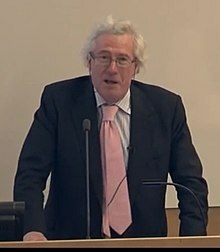 Upon his subsequent swearing-in on 11 January 2012, he adopted the courtesy title of Lord Sumption pursuant to a Royal Warrant by which all members of the Supreme Court, even if they do not hold a peerage, are entitled to the judicial style and title "Lord" for life.. Sumption had been appointed to the Privy Council on 14 December 2011 in anticipation of his joining the Court, whose Justices double as members of the Judicial Committee of the Privy Council. He retired from the Supreme Court on 9 December 2018. Sumption is the first person appointed to the Supreme Court without previously serving as a full-time judge since its inception in 2009. There were only five such appointments to the Court's predecessor, the Appellate Committee of the House of Lords. Two were Scots lawyers: Lord Macmillan in 1930 and Lord Reid in 1948; the others were: Lord Macnaghten (1887), Lord Carson (1921) and Lord Radcliffe (1949). Sumption's narrative history of the Hundred Years' War between England and France (of which four volumes have so far been published, between 1990 and 2015) has been widely praised as "earning a place alongside Sir Steven Runciman's A History of the Crusades" according to Frederic Raphael, and as a work that "deploys an enormous variety of documentary material ... and interprets it with imaginative and intelligent sympathy" and is "elegantly written" (Rosamond McKitterick, Evening Standard); for Allan Massie it is "An enterprise on a truly Victorian scale ... What is most impressive about this work, apart from the author's mastery of his material and his deployment of it, is his political intelligence". Five volumes are planned. Volume I (covering the years from the funeral of Charles IV of France in 1329 to the surrender of Calais in 1347) was first published in 1990. Volume II (covering the years from 1347 to 1369) was published in 1999. Volume III (covering the years from 1369 to 1399) appeared in 2009. Volume IV (covering the years from 1399 to 1422) appeared in 2015, the 600th anniversary of the Battle of Agincourt. Sumption has been praised for a clipped and polished prose style, which he credits to his unwillingness to employ cliché. He admires Gibbon but points out "if anybody wrote like him today they’d be dismissed as a pompous fart". Sumption said that an attempt to rapidly achieve gender equality in the Supreme Court through quotas or positive discrimination could end up discouraging male applicants and so "have appalling consequences for justice". He has criticised the historical curriculum in English schools as "appallingly narrow", warning that by forcing English schoolchildren to study 1918–45 in isolation they "are being taught about Germany and Europe during its most aberrant period". Sumption speaks French and Italian fluently, and reads Spanish, Dutch, Portuguese, Catalan and Latin. He has said that he "rarely learned them using guides, instead I preferred to muddle on through a text with a dictionary by my side." Sumption, Jonathan (4 October 2008). "The pragmatic approach". The Spectator. 308 (9397): 38. Archived from the original on 12 January 2009. Retrieved 23 December 2008. Review of Patten, Chris (2008). What next? Surviving the Twenty-First Century. Allen Lane. ISBN 978-0-7139-9856-6. The Limits of Law (2013). Lord Sumption gives the 27th Sultan Azlan Shah Lecture, Kuala. Lumpur. "The Limits of Law" (PDF). UK Supreme Court. Retrieved 7 August 2015. Office of Fair Trading v Abbey National plc  UKSC 6, won, representing the Barclays Bank plc. ^ a b "Jonathan Sumption QC to be sworn in as Supreme Court Justice" (PDF). Supreme Court of the United Kingdom. 10 January 2012. Retrieved 10 January 2012. ^ Law Lords Department (2000). ^ a b Irvine (2011). ^ a b c d e Steavenson, Wendell (6 August 2015). "Jonathan Sumption: the brain of Britain". Retrieved 15 August 2015. ^ a b Bogdanor, Vernon (21 May 2013). "Sir Keith Joseph and the Market Economy, Lecture delivered at Gresham College". Lecture delivered at Gresham College. Archived from the original on 8 May 2017. ^ a b Irvine, Ian (14 October 2011). "Jonathan Sumption: Donnish but deadly". The Independent. Archived from the original on 18 August 2016. ^ Denham, Andrew; Garnett, Mark (2014). Keith Joseph. Abingdon: Routledge. ^ East Hants Council (2007). ^ a b Dyer (2003). ^ "Press Release:Senior Judicial Appointments". Number 10. 4 May 2011. ^ "Courtesy titles for Justices of the Supreme Court" (PDF). Supreme Court of the United Kingdom. 13 December 2010. Retrieved 14 December 2010. ^ "No. 59746". The London Gazette. 1 April 2011. pp. 6177–6178. ^ "Orders approved at Privy Council 14 December 2011" (PDF). Privy Council Office. Retrieved 13 January 2012. ^ "Former Justices". Supreme Court of the United Kingdom. Retrieved 13 December 2018. ^ Quotations from the selection of reviews displayed on the back of The Hundred Years War III: Divided Houses. ^ a b c "Jonathan Sumption Interview | Quadrapheme". www.quadrapheme.com. Archived from the original on 14 April 2016. Retrieved 28 October 2015. ^ Cohen, Nick (27 September 2015). "Why the Women's Equality party is long overdue". The Guardian. Guardian Media Group. Retrieved 27 September 2015. ^ Bentham, Martin (21 September 2015). "Rush for gender equality with top judges 'could have appalling consequences for justice'". London Evening Standard. London. Retrieved 27 September 2015. ^ "Governing Body". Royal Academy of Music. Dyer, Clare (17 September 2003). "Government calls in top QC". The Guardian. London. Retrieved 31 July 2010. Bowcott, Owen (4 May 2011). "Supreme court judges appointed". The Guardian. London. Retrieved 18 October 2011. Dodd, Vikram (26 September 2003). "Ministers 'did nothing wrong' in revealing identity of Dr Kelly". The Guardian. London. Retrieved 10 February 2010. "Government's brief is a pretty expensive silk". London: The Daily Telegraph. 30 April 2005. Retrieved 10 February 2010. "Obituaries: Anthony Sumption". The Daily Telegraph. London: Telegraph Media Group. 7 February 2008. Retrieved 15 October 2011. Irvine, Ian (15 October 2011). "Jonathan Sumption: Donnish but deadly". The Independent. London: Independent Print Ltd. Retrieved 15 October 2011. Law Lords Department (18 May 2000). "House of Lords Judgments – Three Rivers District Council and Others (Original Appellants and Cross-Respondents) v. Governor and Company of The Bank of England (Original Respondents and Cross-Appellants)". Hrothgar.co.uk. Archived from the original on 19 February 2010. Retrieved 10 February 2010. "Sumption & another v London Borough of Greenwich (2007) EWHC 2776 (Admin)" (PDF). East Hants Council Planning Dept. Archived from the original (PDF) on 22 July 2011. Retrieved 11 May 2011. Leigh, David (15 March 2010). "Taxpayer paid £80,000 to barrister in Binyam Mohamed case". The Guardian. London. Retrieved 16 October 2011. "Jonathan Sumption QC". The Lawyer. London: Centaur Media. 18 December 2000. Retrieved 18 October 2011. Rozenberg, Joshua (23 March 2011). "Supreme Court: runners, riders and delays". Standpoint. London: Social Affairs Unit. Retrieved 18 October 2011. Rozenberg, Joshua (6 April 2011). "Sumption plays hard to get". Standpoint. London: Social Affairs Unit. Retrieved 18 October 2011. Croft, Jane (31 August 2012). "Berezovsky loses against Abramovich". The Financial Times. London. Retrieved 11 September 2012. This page was last edited on 10 April 2019, at 18:58 (UTC).